It’s been a while since Apple has offered Macs with built-in optical drives that could make use of a CD or DVD. The last models were the 2012 Mac Pro and the mid-year 2012 non-Retina 15-inch MacBook Pro. Apple first removed the optical drive in the 2008 MacBook Air, but as of the end of 2013, when the Mac Pro was replaced with the newer model, all optical drives were gone from the Mac lineup, at least as built-in options. That doesn’t mean there isn't a demand for optical drives or the CDs or DVDs that are used in them. That’s why external optical drives have been a popular peripheral for many Mac users. Whether you have an older Mac that has a built-in optical drive or an external drive, you can eject a CD or DVD in several ways. The Mac, unlike most Windows PCs, doesn't have an external eject button on its CD/DVD drive. Instead, Apple made use of the ability of optical drives to respond to an open or close command sent over the drive's electrical interface. By using the open and close commands, the Mac offers several options for ejecting a CD or DVD. Some Apple keyboards have an eject key, usually located in the upper right corner of the keyboard. Press the Eject key to eject the CD or DVD from the drive. 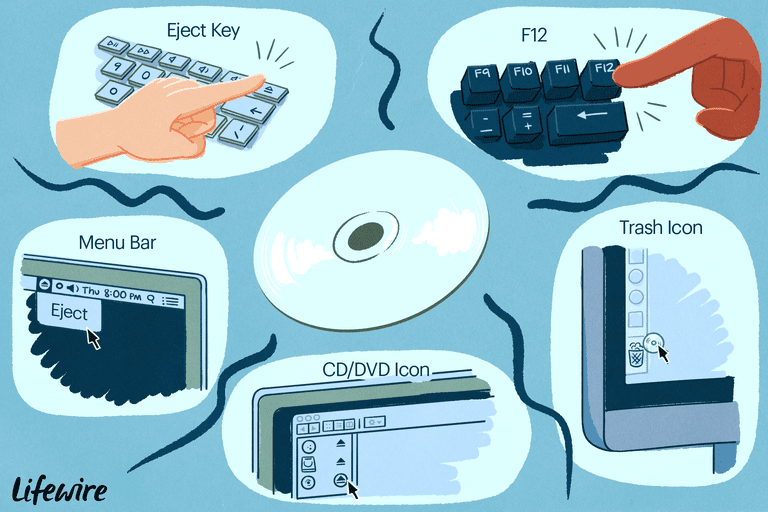 On any keyboard, including those originally designed for use with a Windows PC, press and hold the F12 key until the CD or DVD is ejected from the drive. This may take several seconds. Locate the desktop icon for the CD or DVD. Click and hold on the icon and drag it to the trash. You'll notice that the trash icon changes to an Eject symbol, as the CD or DVD icon is positioned over the trash. Perhaps one of the quickest ways to eject a CD or DVD is to right-click on its desktop icon and select Eject from the pop-up menu. Some applications, such as iTunes and Disk Utility, have an eject command in a menu or toolbar. Launch the application and use the eject command to eject the CD or DVD. Use the Eject menu applet located in the Mac's menu bar. If you don't see the Eject menu applet, you can create one using the instructions in Add a Menu Bar Item to Eject a CD or DVD. When all else fails, click and hold the mouse or trackpad button while restarting your Mac. External optical drives typically respond to the seven methods of ejecting a CD or DVD on a Mac, but they also have a few tricks of their own. Most external optical drives have an eject button built into the front of the drive's case. Pressing the eject button causes the device tray to open or the optical media to be ejected if it's a slot-loading device. Some external optical drives appear to be missing an obvious eject button, but if you look closely, you'll see a small hole in the front of the case large enough to insert a straightened paperclip. Push the paperclip into the eject hole until you feel resistance, then push it a bit further to open the CD/DVD drawer on the optical drive. The external eject button's function can be overridden if your Mac thinks the optical disc is in use. You can get around this problem by first quitting the app that is using the optical drive and then using the external eject button. If the external optical drive still won’t eject the disc, try shutting down your Mac, and then using the drive's eject button. Once the disc is ejected, you can restart the Mac. External optical drives are usually made from standard optical drives mounted in an external case. The drive can usually be removed from the case. Once removed, the drive tray may expose the eject hole that was covered up by the enclosure, and you can use the paperclip method. Make sure the external optical drive is turned off and disconnected from your Mac. Insert the flat blade screwdriver tip into the lip between the tray and the case of the drive. Gently lever the tray open. You may feel some resistance and the sound of gears moving within the drive. Be sure and perform this step slowly. Brute force should not be required. Close the tray when the task is complete. The Best Free Software Programs to Design CD and DVD Covers?